Up to 50% Off in the Mid Season Sale at Hotter Shoes - Includes Boots, Heels, Pumps and More! This shoe brand for savvy shoppers earned The Queen’s Award for Enterprise a few years ago, and it’s easy to see why Hotter continues to please customers with its innovative footwear technology. 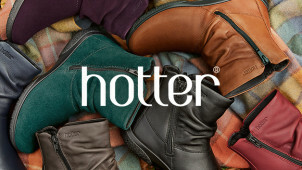 Hotter footwear is sold through 70 Hotter stores and more than 200 independent retailers nationwide. Hotter keeps its production here in the UK, so its shoes are reasonably priced and are finished to a very high quality. Hotter caters for feet of all shapes and sizes, and includes wide and slim fits for men and women. As well as men and women’s shoe categories, you can shop for ‘Originals’, ‘Accessories’ and ‘Holiday Shop’ on the website. Keep your eyes peeled for clearance items, which you’ll save even more money on. If you’re going on holiday soon, it’s worth browsing the Beach Life pages, as some products are two for one, so you’ll have shoes to match every outfit! How do I use my Hotter Shoes discount code? Sign up for exclusive emails that give you access to discounts, offers and Hotter news. Can I request a Hotter Shoes catalogue? Yes, simply fill out the form on the ‘request a catalogue’ page of the website. Is there a Hotter Shoes fitting guide? Yes, there’s a series of guides and videos on the website to help you get the best fit for your Hotter shoes. How can I find out about technology used in Hotter Shoes? The Hotter Pyramid technology is explained on the website. Call free on 0800 083 8490 to speak to a Hotter customer representative. Allow up to 5 working days for delivery within the UK of in-stock items, and up to 10 days for international deliveries. For deliveries within the UK post and packing is £4.95 per order. For the rest of the world postage and packing is £12.50 per item. Click and collect from Hotter stores is free of charge. Hotter offer a return service for all UK orders. If you wish to exchange your goods, the return shipping is free, however, if you are returning them for a refund using Hotter's prepaid service, you will be charged £2.50 to cover costs. Use the handy ‘store locator’ to track down the opening times for the store you wish to visit. Hotter is a family-owned shoe brand that excels at creating beautiful, stylish shoes with innovative built-in comfort. If you’ve got a holiday coming up, why not use your Hotter Shoes discount code to treat yourself to a pair of shoes that will be strong enough to keep you striding through the streets all day without giving you a pesky blister! Hotter has a massive range of sizes and styles to choose from, and even sells accessories to complement your shoes. Hotter is a shoe brand that started from humble beginnings. In 1959, the Houlgrave family decided to design and make slippers in Lancashire. They set up a small factory, and began to diversify - making a range of shoes that had the built-in comfort of a slipper but with the style and elegance of a regular shoe. Business took off and over 50 years later, the family still produce popular, high street brand shoes - from a high tech facility in their home county. Are you going to be rambling over the hills of Exmoor or the Lake District in the holidays? Good weather is never a guarantee in this country, so we’d recommend you use your Hotter Shoes voucher codes to invest in a pair of GORE-TEX walking boots. These hardy, trusty walking boots will keep you dry and give you a bounce in your step! GORE-TEX boots have a breathable membrane that ensures your core temperature is regulated.